With Christmas fast approaching, we’ve rounded up a few of the best holiday markets in the city that you’ve gotta check out this holiday season! From unique gifts, one-of-a-king art and whimsical crafts, here are some of the more interesting places to visit around town this Christmas holiday. Winter Village at Bryant Park: Hugging the edges of Bryant Park’s outdoor skating rink and framed by the grand main branch of the New York Public Library, the Winter Village is the most scenic of the winter markets in Manhattan. Some 170 boutique shops fill the walkways of the park through January 2. When you’re done shopping, lace up your skates for a spin around the rink, or warm up at The Lodge, a glass-enclosed food hall and bar. Union Square/Columbus Circle Holiday Markets: These European-style markets are both open daily through December 24, but each has its own vibe. There’s an elegance to the offerings at the Columbus Circle market, located at the 59th Street entrance to Central Park, with design-forward housewares, stylish jewelry, and original artwork. Signs identify products that are local, organic, free trade, recycled, and handmade. Downtown, the bustling Union Square location presents an eclectic array of on-trend gifts and includes a Little Brooklyn section at the southwest corner of the market that highlights makers and businesses from the borough. 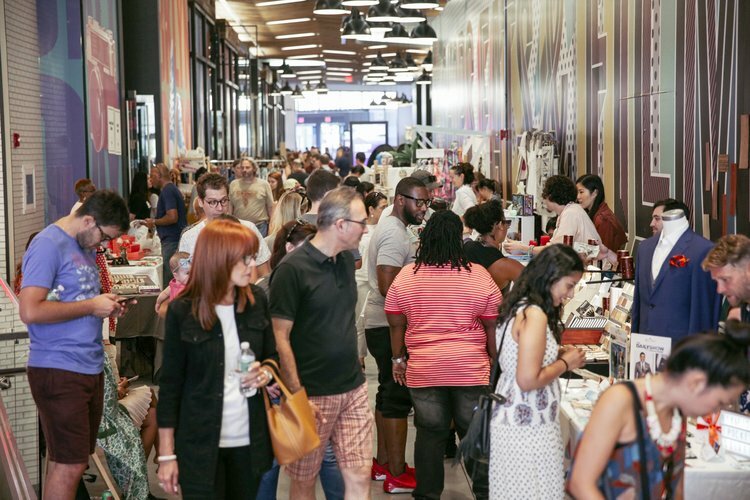 FAD Makers Market: Indie chic Fashion, Art, and Design (FAD) items handcrafted by more than 200 artisans are part of this carefully curated holiday market that pops up at the Brooklyn Historical Society on December 1 and 2 and at City Point December 8, 9, 15, and 16. For foodies, the culinary sister market of artisanal finds is held at the Brooklyn Historical Society on December 8 and 9.